Bacon roasted chicken is one of my fall-back recipes for those times when I can't think of anything I want to cook. One large breast (16 ounces) will feed two but takes longer to cook so I look for smaller 8-ounce breasts. On the other hand, two large breasts will feed two and make two sandwiches for lunch the next day. Those of you who follow this site know I'm all about cooking once and eating several times - I think it makes huge sense for one or two-person households. This recipe combines the flavors of chicken, bacon, and herbs to make a satisfying meal. (Larger image.) Serves 2. Heat oven to 375 F and line a baking sheet with foil. Sprinkle breasts with salt and pepper and herb mixture. Remove breast from bone and slice across grain. 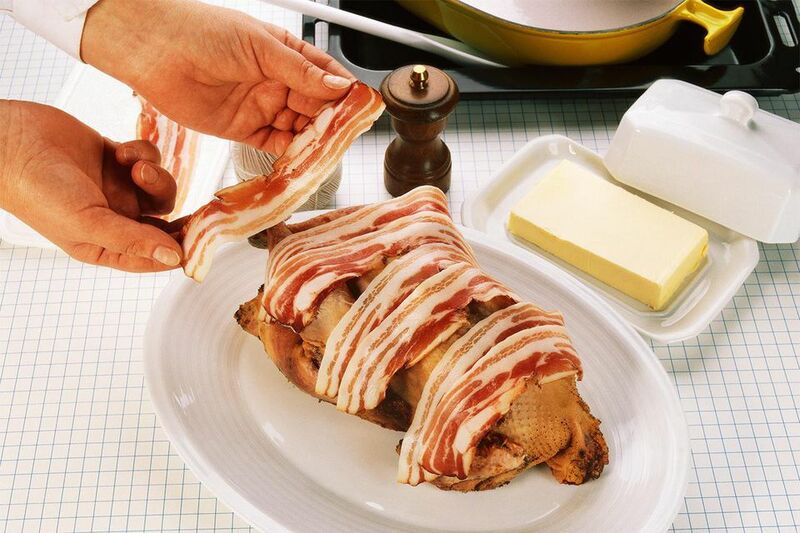 *Note: You can use a boneless breast, but a bone-in breast holds the meat up above the fat that renders from the breast and bacon so the breast is much less fatty. It also contributes to the flavor.